Thank you all for the lovely comments! I have a quick share today. Here is some work in progress. 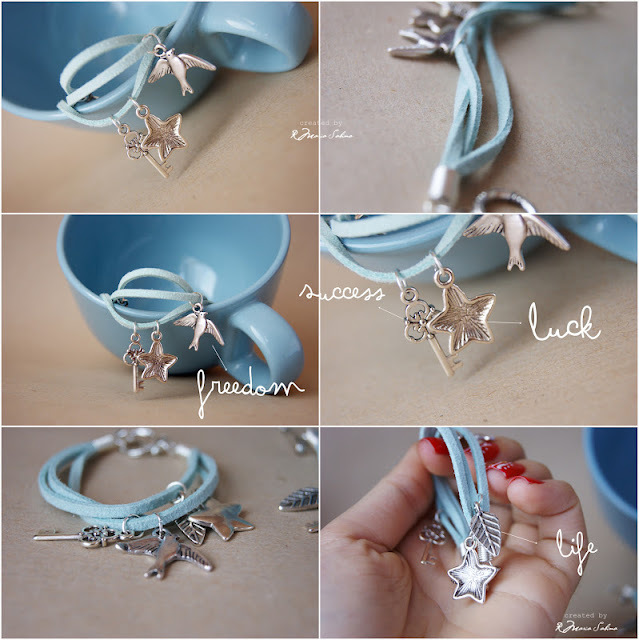 Two handmade bracelets for two beautiful girls! 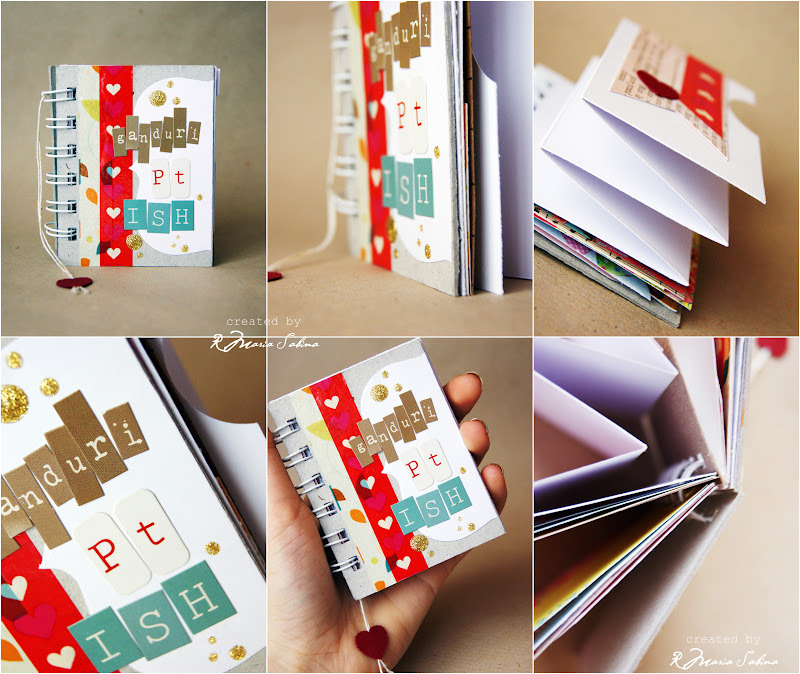 A custom small smash book for my favorite client Madalina. That's all! If you have questions please leave a comment below. Take care! Yum Yum ! 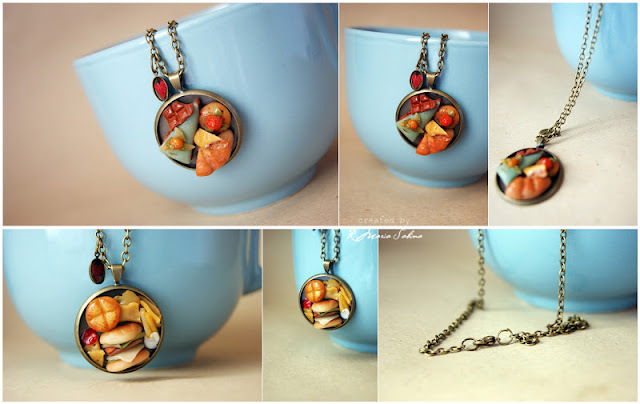 New miniature food jewelry. Enjoy! They are all available in my breslo SHOP. Today's another great challenge over at SDC! 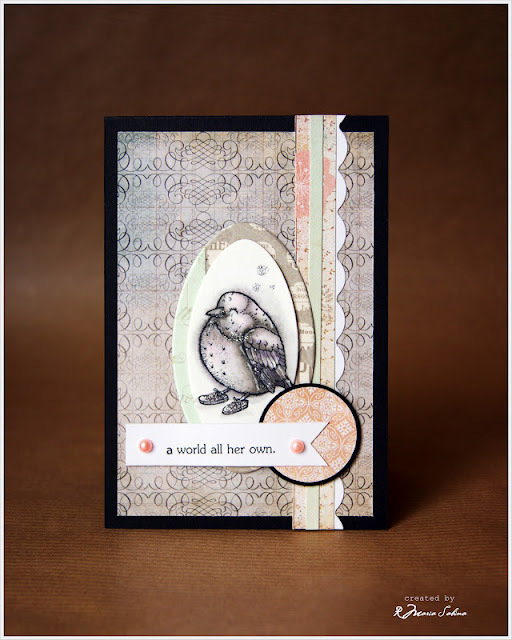 This week our hostess, Kaz Boughton has given us a fun theme to work with and I think you'll love to see how the design team used their stamps. Well I must say that this is one of my favorite challenges! I love buttons and birds! 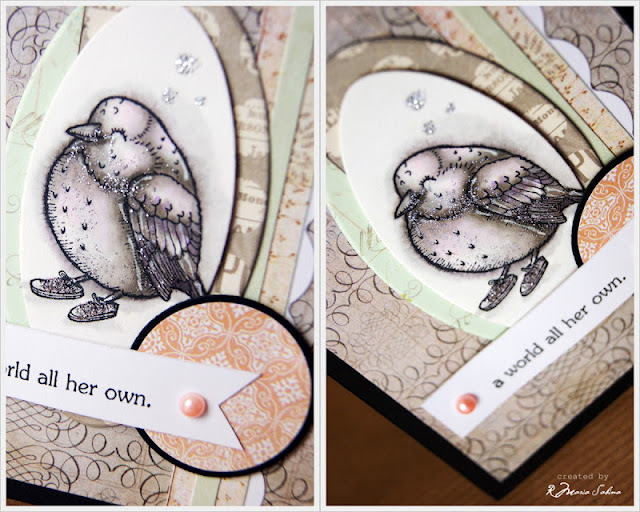 I used Birds and Bugs Cube stamps s by Stampotique Originals. Don't forget to check out this amazing challenge. You can win a great prize! I don't like tea, coffee but I love hot chocolate! 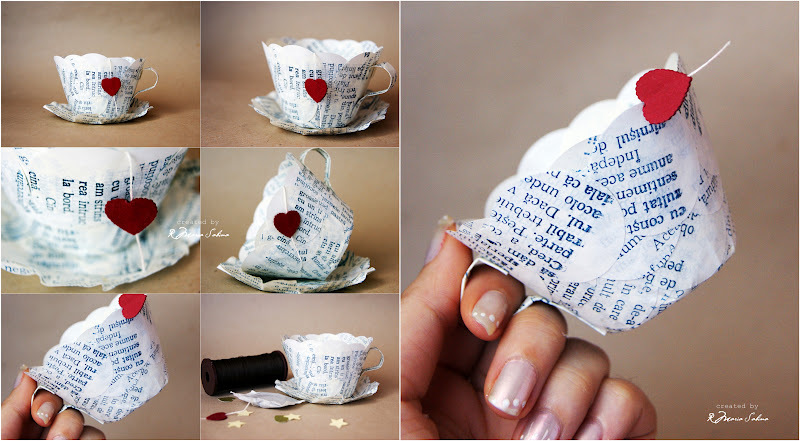 I made this quick tea cup today. It is just another crafty experiment . 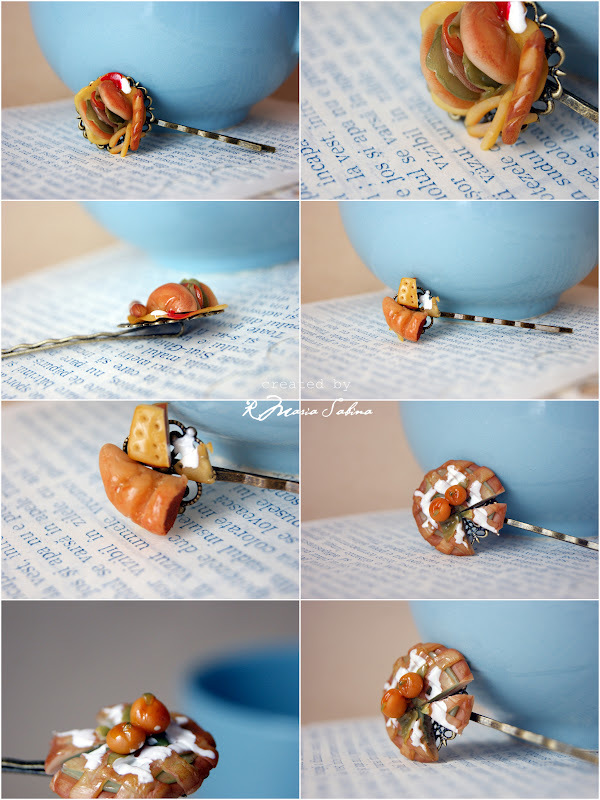 I used a glass, a circle punch, glue and an old book! Looks great! 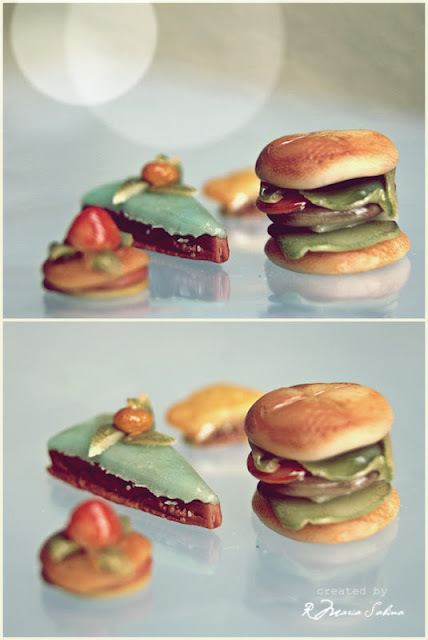 Today I made some miniature food. These are just some of my miniature clay foods. This is not the final result! More details coming up soon. I love fast food but I don't really like eating cakes. Cupcakes vs cakes? I prefer cupcakes! What do you prefer? By the way! Check out Pro 31 Designs! Awsome sale!!! Hope everyone had a great week! Today is another SNSC project + video tutorial. 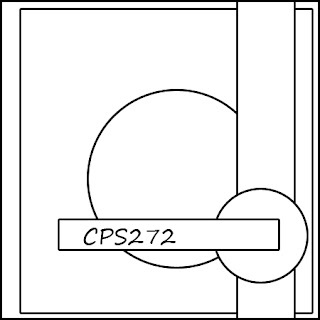 Check out the new digi stamps from SNSC here. Make sure you stop by and share some love to Lina. 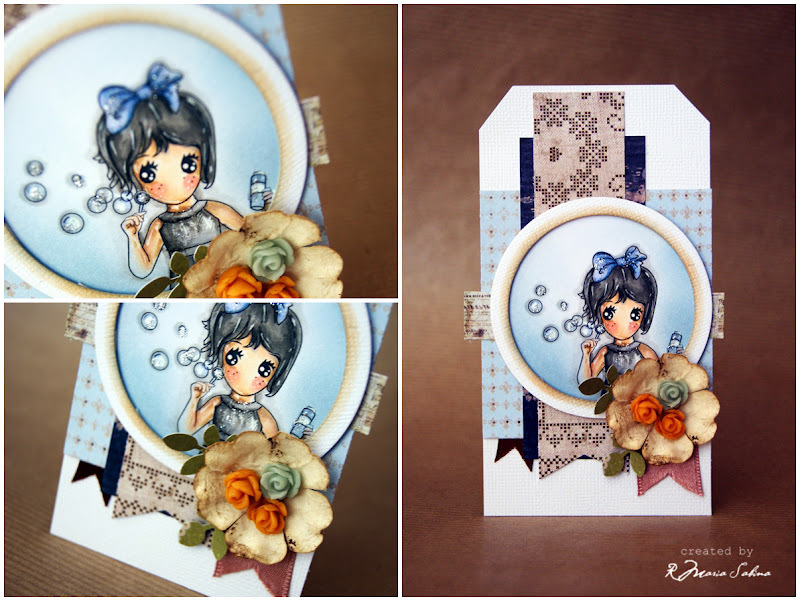 I used Soap Bubbles Sophie by SNSC. Today's sketch is from Mojo Monday. Check out the video tutorial here. Don't forget to ''LIKE'' my Facebook page for more updates. This is another fun experiment! I love it! More coming up soon. Sleepless night, awful morning....But it's all good now! I feel a lot better! Today is another Scraps n' sketch project. Crafting is like medicine for me (most of the time)! So yeah this makes me feel good! Last night I bought new digi stamps from Tiddly Inks. AWSOME! Here is my project for today using my new digi stamps. 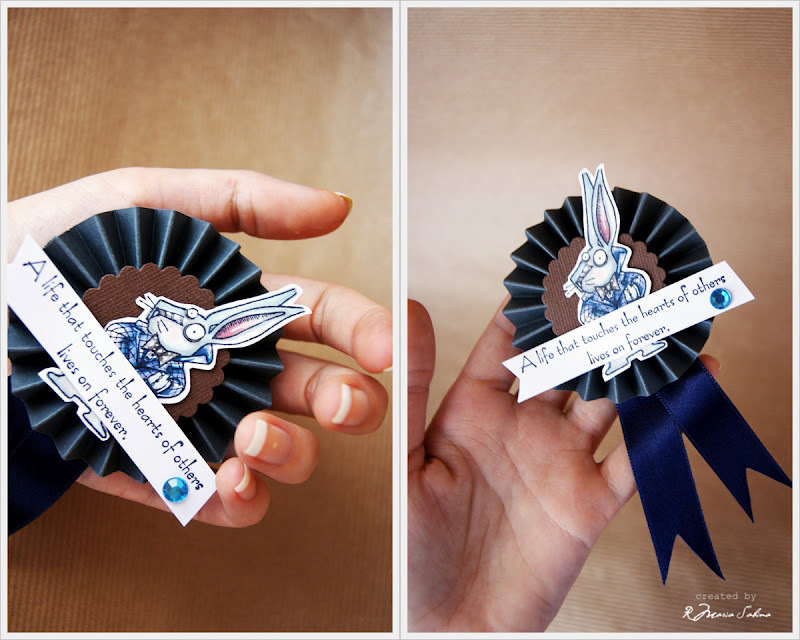 I don't have a sketch for today but here is a new challenge from Flourishes. Make sure to subscribe to my Youtube channel for the video tutorials. 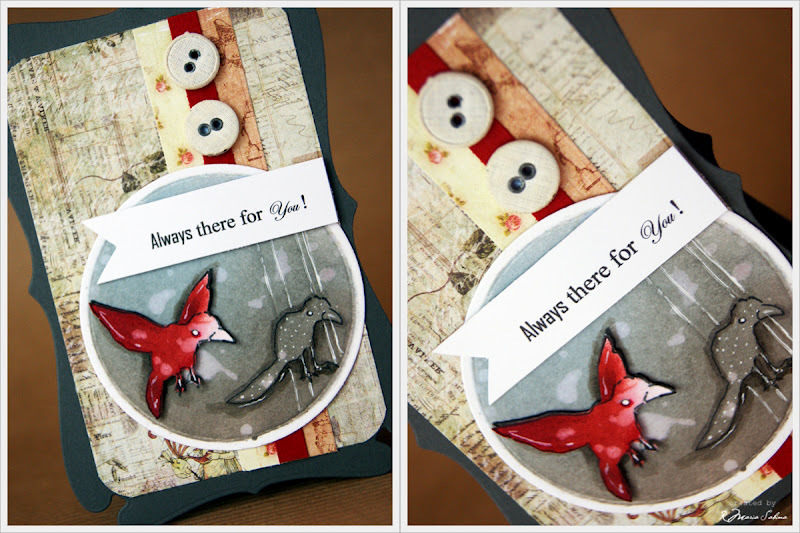 Watch the video tutorial for this card here. Have a great weekend! 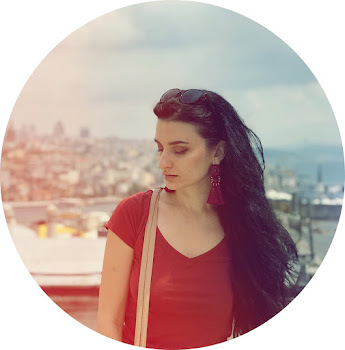 Jane here: I am hosting the newbie challenge here for my first time :). 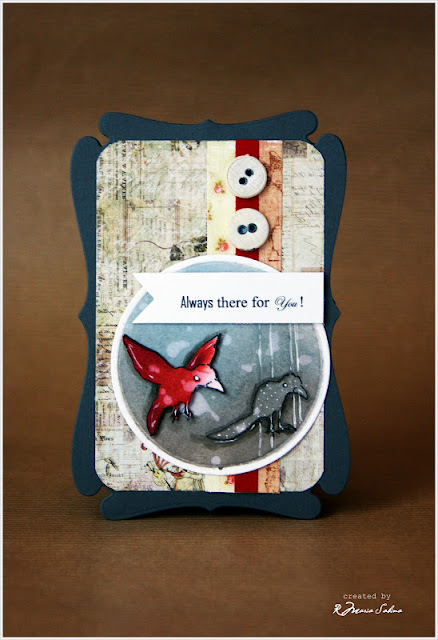 So, we all know that Stampotique has many fun images....how about all the very cool sentiments?? Since I have fallen deep for art journaling I have found that my Stampotique images and sentiments/quotes go perfect in my journals. Below I used some stencils, acrylics and magazine cut outs to create this art page. The quote is called " Lying in bed" (by sark) and it is perfectly the way I feel! lol Sometimes I wonder about my addiction! I cut it out in sentence pieces and put it on some painty scraps and then popped them on the page. I also used "squiggle arms" by Roc Nicholas on the left side. If you happen to be looking for art journal inspiration...look no further then some of the artists and dt members for Stampotique! Lots here! I really love this rabbit!!! The stamps I used are from Stampotique. I used Rabbit and A life that touches the heart of others. Hope you will join us using one of your Stampotique sentiments for this challenge and maybe be the winner of a $30.00 gift certificate for stamps to the Stampotique store! Please remember you must use STAMPOTIQUE stamps to qualify to win and only one entry per person. 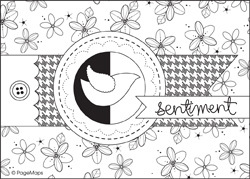 I am so excited for you to be joining Sweet Nothings Stamp Co. and it’s very talented Design Team for our July Creative Challenge. From now on, the 2nd Tuesday of every other month we are going to run a Creative Challenge. 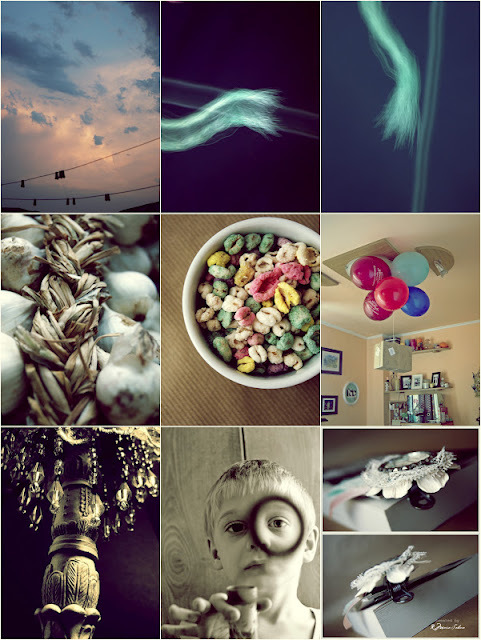 Some months the challenge may be a color palette to work with, other months it may be a theme or a layout. Every other month will be something new and creative for you to challenge yourself with. There will be a sweet little prize to be won as well. For the month of July, we will be challenging you to create a project with a card sketch. This super cute sketch is great for any type of card and you can use any sentiment. 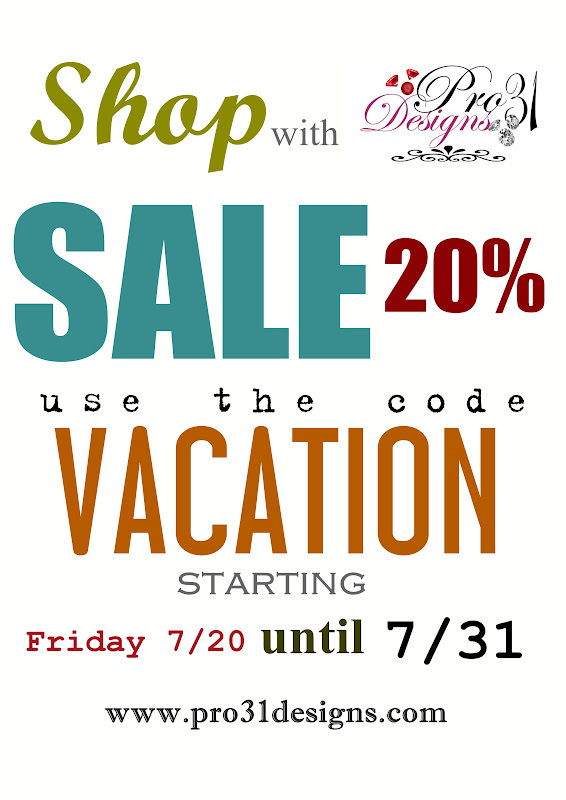 Prize this month is a $20 gift certificate to Bluemoon Scrapbooking.com. With all the supplies available over there, you'll be able to treat yourself to a little something on us! 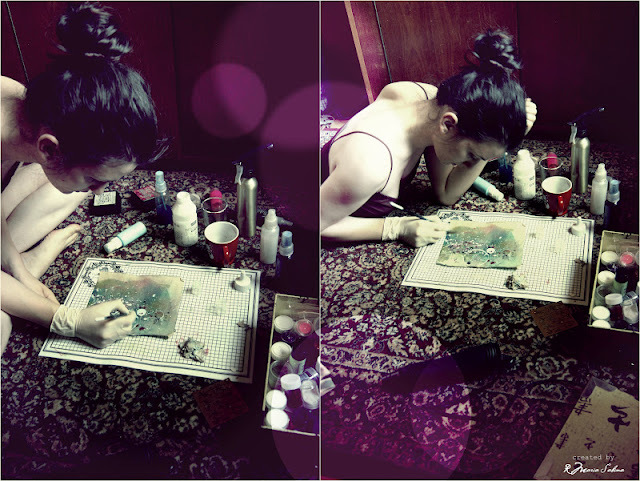 I do hope you love my project. 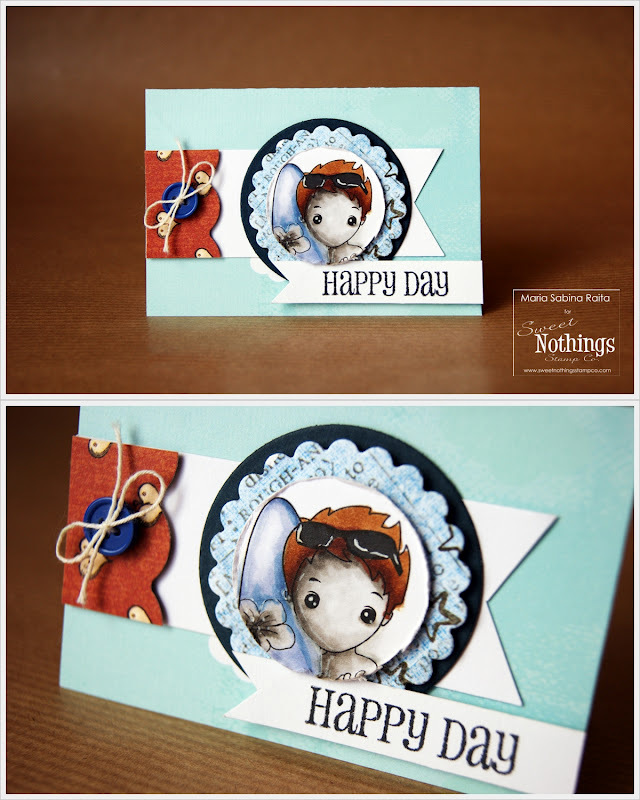 Be sure to check out the other amazing Sweet Nothings Stamp Co. Design Team member's blogs for other great ideas. This is going to be a super quick post. I made a new card for a great challenge. Check out Flourishes for more details . Hope you like the card. If you have questions please leave a comment below. Have a great day! Today's my mom's birthday and also Adina's birthday. So Happy B-day ladies!!! I know , it's been a while since I made a video tutorial. 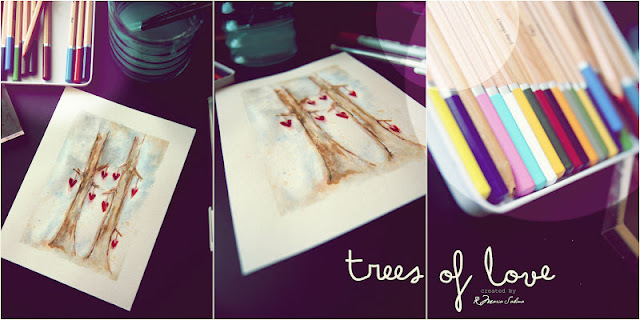 Today I am back with a new video tutorial and back with my scrap n' sketch video series. 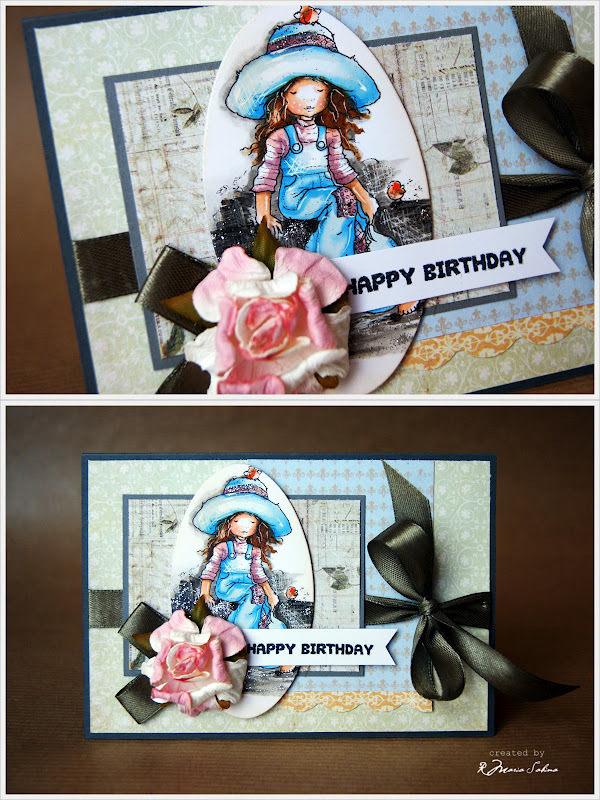 Check out the video tutorial for this card! If you have any question please leave a comment below. Have a great weekend! I have WONDERFUL NEWS! Celebrate Adina's Birthday!!!! 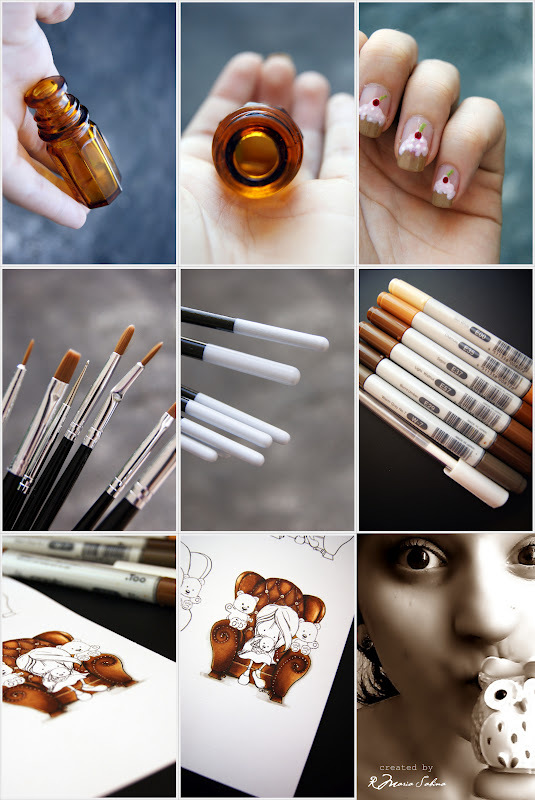 If you don't know her make sure you check out her amazing work over here! 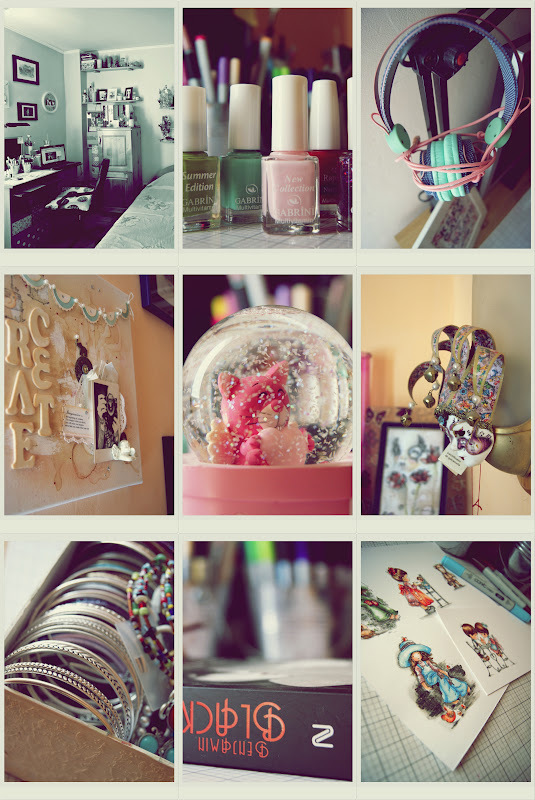 Check out her shop today and tomorrow ( July 5/6 ) .You get 25% off if you buy the collage products. 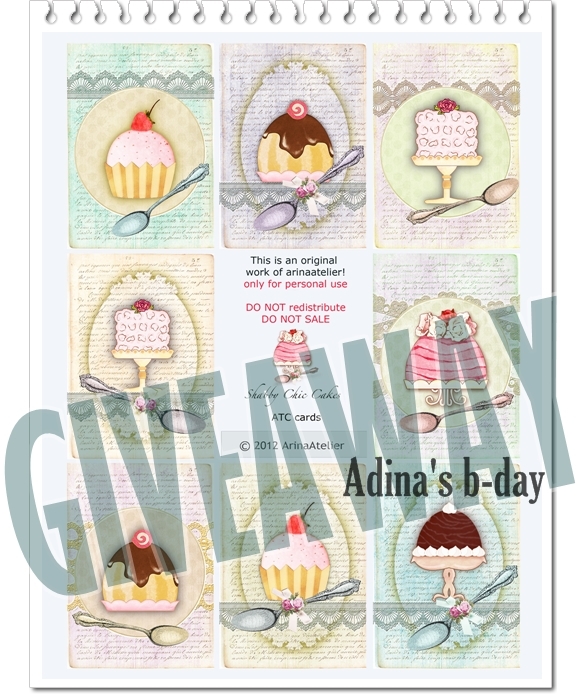 Use the coupon code ARINABIRTHDAY1. 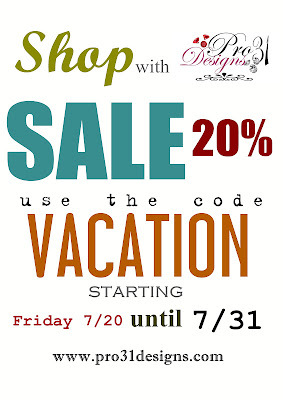 Remember the coupon code is only for today and tomorrow! Thanks! You can win this amazing giveaway! This is a digi Collage Sheet - Printable Sheet. Awsome high quality! You can get yours here. To win this giveaway please read the rules! Make a tag, card or an ATC with the theme : Birthday. For a second chance please subscribe to my Youtube channel and leave a comment on this video. Please check out Adina's Facebook page and Etsy shop. Happy B-day Adina! Thanks for thanks for sponsoring this giveaway! Today begins a new month and Stampotique is sponsoring another month long challenge over at Card Positioning Systems. They provided us with a sketch to work with. For my card I used 2 different stamps from Stampotique. Birdy shoes and World all her own. 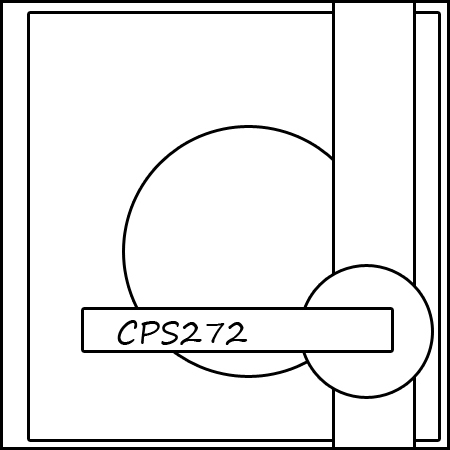 So make sure to join us over CPS with your interpretation of the sketch for a chance to win a $30 gift certificate for stamps at Stampotique.Good luck!